Who is the man so enigmatically depicted on the cloth? I contend that to anyone who has taken the trouble to investigate the matter for themselves - with an open mind - the claim made above by the author, John Walsh, is likely to be their conclusion, too. If this sounds unlikely just look closely at the images below. On the left is the image as it appears to the eye. 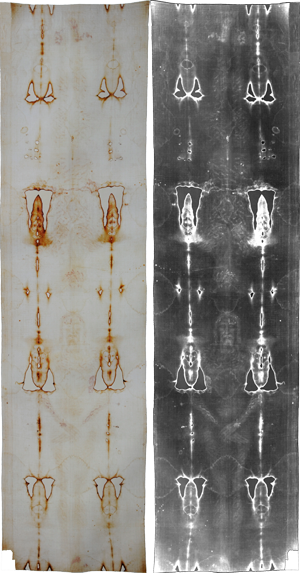 On the right is the same image in black and white and rendered as a negative - i.e. with light and dark reversed. Try and ignore the patches running up both sides. These are scars from a fire in 1532. I have made a study of the subject through four documentaries made over a period of over forty years and winning a BAFTA and other international prizes in the process. They are all available to view on this site. If you think the C14 test carried out in 1988 was the last word on the subject you are in for a surprise. 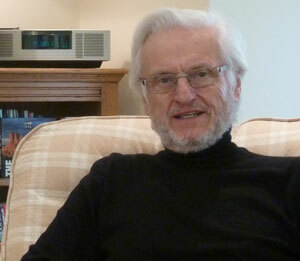 I give regular talks on the subject and welcome enquiries from anyone interested in arranging one. 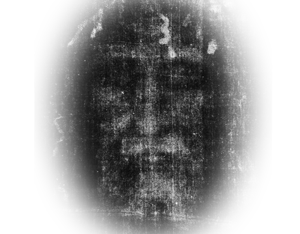 This site exists to promote awareness and knowledge of the Shroud of Turin. All my films are available to view here free of charge. There is an opportunity for you to donate towards the site's development and outreach as well as my campaign to restore justice to the Shroud but please feel under no obligation. I want the films to be seen. If you do find them interesting I do ask you to let others know about this site. Thank you. Do not just take my word for a re-examination of the subject. Before watching my films have a listen to what the current head of the Oxford Radio Carbon Unit had to say when he saw the accumulated evidence. Commissioned by the Dioceses of Turin for the 2010 and subsequent expositions. Commissioned by Pam Moon in association with her Shroud Exhibition. Commissioned by the BBC and presented by Rageh Omaar.